Citizens’ Moral and legal Duty! The Nuremberg Tribunal of 1945-46 which passed judgment on Nazi war criminals declared that soldiers and citizens have a duty to resist the crimes of their government. The Tribunal said following orders is no excuse. One of the most well known U.S. war crimes of the Vietnam war was the My Lai massacre on March 16, 1968 where over 500 unarmed civilians, a majority of whom were women, children (including babies) and elderly people, were slaughtered by U.S. troops at the village of My Lai under orders from Lt. William Calley, Captain Ernest Medina, and other high ranking officers. Hugh Thompson, a Warrant Officer helicopter pilot, put his helicopter down between U.S. troops and fleeing Vietnamese civilians. Through a bull horn, he boldly said, “You would not shoot at a US helicopter, would you?” Thompson risked his life and reputation by ordering a higher ranking officer to stop the killing of civilians at My Lai. For his bravery, Thompson remained under a military cloud for over thirty years. He could have been convicted of treason and not respecting a senior officer. However, justice ultimately prevailed. Thompson and his two helicopter crew members were eventually given high honors by the Pentagon. Calley, the only person convicted of murder in the massacre, served four and one-half months in prison. Today, as we start the New Year of 2011, PFC Bradley Manning sits in a solitary confinement U.S. Marine Corps prison cell in Quantico, Virginia. He has been in custody 5 months and faces a possible life sentence. He is enduring conditions that are cruel, inhumane, and bordering on torture. He has not been convicted of any crime, but is alleged to have released audio/video footage to Julian Assange of WIKILEAKS of a US helicopter attack killing innocent civilians, including two Reuters journalists, in Iraq. The killing of innocent civilians (in Nazi Germany, Vietnam, Iraq, or anywhere) is a war crime. It appears that Bradley Manning had no power to stop the killing shown in the released video, but by exposing that war crime, perhaps he believed that people would be held accountable and other innocent civilian lives could be saved. I hope you had a good Christmas with family and friends. This is a reminder. There will be a peace organizing meeting on Monday, Dec. 27th from 7-9PM at the Keaau Community Center. 1. Pohakuloa training expansion plans and EIS hearing coming up: Jan. 11 in Hilo and Jan. 12 in Kamuela. Written comments will be accepted until Feb. 7. 4. Support for Wikileaks Julian Assange, and Bradley Manning. Bring your ideas and friends. We need to broaden the movement for justice, peace, and the earth. 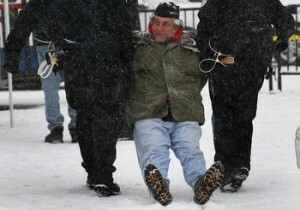 A veteran is dragged away while being arrested during an anti-war protest in front of the White House December 16, 2010 in Washington, DC. Getty Images. Up to 134 people were arrested at the White House fence. Dozens more arrested in San Francisco and New York. Below are excerpts of a “Call to Action” issued prior to the protest. “There are children being orphaned, maimed or killed every day, in our name, with our tax dollars; there are soldiers and civilians dying or being maimed for life, in order to generate profits for the most odious imperialistic corporate war machine ever, again in our name. How long are we going to let this go on? Until it is too late, until this destructive machine destroys all of us and the planet to boot? The “Call to Action” was endorsed by Veterans For Peace and more than 30 other organizations. Visit the website at www.stopthesewars.org or on facebook join: “Take A Stand for Peace”! Please vote (link below) in the Big Island Weekly poll on the TMT on Mauna Kea. The poll is on the right hand side of the page. Scroll down. See my testimony below against the TMT. The Big Island Weekly is running a poll on whether the TMT should be built or not. Mauna Kea could use your kokua! Please forward to all your friends and contacts. > The TMT project has the same smell as the fast track DLNR plan years back to put geothermal development in the Natural Area Reserve Conservation district known as the Wao kele O Puna Rainforest –the last remaining intact lowland rainforest in Hawaii. That misguided effort resulted in hundreds of arrests for non-violent civil resistance and was stopped over the failure to do a Federal EIS. The same may be required for the TMT. Federal funds are involved and no Federal EIS has been done. > Our non-profit organization grows food to share with people in need and to support the work of justice, peace, and preserving the environment. We stand in strong opposition to the Conservation District Use Permit requested for the Thirty Meter Telescope on sacred Mauna Kea. We recommend that the Board deny the permit request for the following reasons. > The current state of Mauna Kea represents a microcosm of our planet heading off the cliff of Global Warming due to over-development. > For our planet, the evidence is crystal clear that the present course of industrial development is heading for unprecedented catastrophe. But are we willing to seriously change the way we live, and the decisions we make day to day. Are we willing to put conservation before development? > 1. We know that the cumulative impacts on Mauna Kea according to the 2005 EIS done by NASA are “substantial, adverse and significant” yet we still go forward with more building: 5 meter telescopes, 10 meters, now 30 meters, with no end in sight. The “bigger is better” logic will eventually put a mirror over the entire summit. > 2. We know that No study has been done to assess the carrying capacity of the mountain for development. > 3. We know that the University of Hawaii and its self appointed Mauna Kea Management Board are in a position of conflict of interest. The University benefits financially from telescope development yet it is suppose to be a management entity for conservation on the mountain. The record is clear: development trumps conservation. When will we learn? When will we reverse course and put conservation before development? > For our organization the bottom line is this. The host culture of Hawaii tells us that the summit of Mauna Kea is the most sacred temple in all Hawaii. In fact, Mauna Kea and Mauna Loa are two of the most sacred sites in all the Pacific. Do we simply hear those words but have no understanding of their meaning? Or do we understand but disregard the meaning out of other concerns –science, prestige, development money and jobs? In any case, to proceed with further development in the summit area of Mauna Kea is desecration of the most sacred temple in Hawaii. It is disrespectful. It is shameful. In the Judeo/Christian sense, it is sacrilegious. It is sinful. The irony is that looking into the heavens will be our downfall because we have not shown respect. We look into space but not listen to the native people of this place. If we want to be pono, the means we use must be in line with the end that we seek. It is time to live aloha — live the principles of non-violence in Hawaii and around the world. Aloha demands justice. The conflict over expanding construction on Mauna Kea, like the expansion of militarism and warfare training at Pohakuloa represent sores/infections on the ‘aina. They are symptoms of a deeper problem. What is truly needed to heal is to end the ongoing illegal U.S. Occupation of Hawaii. I am confident that a reinstated independent nation of Hawaii would never permit the desecration of its most sacred temple. > Deny this permit request. Mahalo.